Alas, no sane person does that. They just treat themselves with a very well made dish and enjoy each bite every now and again, right? Having said that, here’s my quick and easy bruschetta! First, drain your tomatoes. 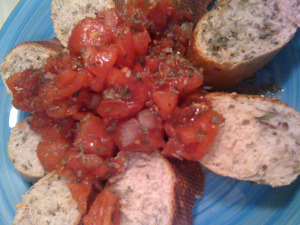 You don’t want that tomato “juice” in your bruschetta. Pour your balsamic vinegar and olive oil in a separate bowl together. Mix in your basil and garlic. Pour your tomatoes in a large bowl, followed by your onions. Spread your tomatoes around the bowl, then pouring your vinegar and oil mixture over the top. Stir them up thoroughly, then using an extremely light dusting of salt until it tastes just right. Take your baguette, and instead of slicing it straight across, cut it diagonally. Lay ’em flat on your plate. Be decorative! I just so happen to like starbursts, so that’ s usually my go-to. Grab a spoon and pour your tomato mix all over on top, and ta-da! I love italian! This was just in time cause I have extra tomatoes from a recent trip to the grocery. I’m so excited. So does that mean canned tomatoes can still be part of a clean eating lifestyle? I must admit, that surprises me – I thought they would be full of preservatives and the like! Or perhaps you’re referring to “homemade” tomatoes you (or someone) have canned yourself? This blog rocks, BTW. You’re becoming a daily habit for me. They can be – tomatoes are available in cans without preservatives and are available outside of being canned yourself (though that is ideal.) The trouble with canned tomatoes has more to do with BPA than preservatives.